In a recent Facebook blog, Mark Rabkin, the VP of Core Ads at Facebook, discussed everyone’s favourite media platform: smartphones. He mentions in the article that just as televisions were not just a modern version of the radio, smartphones are not just tiny televisions. TV was revolutionary because it gave every household a screen, smartphones give every person a screen, on their person, at all times. This constant access to content means that advertisers have to create attention-grabbing, thumb-stopping content in order to capture and hold the small amount of attention consumers have. In fact, Facebook studied the Facebook activity of 537 participants as they watched the season premiere of a popular TV show. They found that during every commercial break, their Facebook activity rose. Advertising has come a long way since the days of Madison Avenue executives, in their glass towers coming up with the next great marketing campaign. We are able to target people based on age, gender, location, interest, if they are in the market to buy your product, and so much more. Remarketing (showing ads to someone that has previously visited your site but has not converted) is one of the coolest targeting methods, but for a long time there has been something us advertisers have been waiting for… cross-device retargeting. Cross-device remarketing has been on our wish-list since 2013, and it’s crazy to think it has taken this long for Google to enable it. Why is cross-device remarketing important? And according to Google, this is standard for the average person. Up until now, if you wanted to remarket to someone like me, you had to do it separately for mobile and for desktop, which makes it tougher to keep your story consistent; and because most online conversions start on one device and end on another (60%), telling a single story, with consistent and linear branding to your audience, is essential. This is now possible with cross-device remarketing, where – in an advertising sense – you are able to view someone as a single person, instead of Person A on mobile an Person A on desktop. This also give us greater control with how often those potential customers see your message, as we can cap the frequency your ads are shown overall to that person, instead of separately on mobile and desktop, which had the possibility to show your ads too often. A user has to be signed into their Google account for this to work, but considering Google now has over 1 billion monthly active users, that is a big pool for you to pull from. Want to start cross-device remarketing or have questions? Feel free to reach out to info@strathcom.com. The shift to mobile is happening and there is no doubt that consumers are making most of their purchasing decisions based on searches from their mobile device. According to a U.S. study, 4 out of 5 car shoppers use their phones in the purchasing process, and 63% of shoppers are still shopping on mobile while at a dealership. With 86% of consumer research being done online, how does your dealership stand out in a mobile-driven world? Here are some mobile-driven strategies to help your dealership win mobile moments. Before shoppers visit a dealership in-person, they’re likely going to make a phone call instead of using email, chat, text, or social media. 60% of car shoppers would use a “call” button if it were available in a search ad. Call extensions should be a standard feature to your mobile ads, but making sure your call extensions are running during your operating hours, and are tracking Call Forwarding numbers will drive your dealership phone leads. Optimizing your mobile site to allow phone calls can also increase your dealership’s mobile performance. If you are only tracking form completions from your mobile site, you could be missing half of your website conversions. Price Searches: more shoppers are searching for the prices of their vehicle of interest on mobile. By targeting “MSRP” and price keywords, you can help shoppers make quick decisions regarding the vehicle they’d like to purchase. Near Me Searches: 80% of searches for “car dealership near me” were made on mobile. By enabling location extensions, you can appear on the top results for shoppers looking for the nearest location to them. Canadians spend one out of every four minutes of their time spent on mobile surfing Facebook and Instagram. Facebook is effective in the consideration phase of the customer journey since targeting includes options such as vehicles of interest, current vehicle, life events, and many more. Utilize Facebook ad formats and targeting to reach your customers where they are the most. Mobile marketing can provide your dealership with plenty of strategies to drive sales offline. Don’t let your dealership fall behind on the shift and contact the experts at Strathcom Media at 1 (888) 914-1444. How Mobile-Friendly Are Your Ads? Mobile search has become a way of life for consumers. In fact, Google proclaimed that 2015 was the first year that saw more searches being done on mobile devices than on desktops and laptops combined. Not surprisingly, more and more people conduct their research online before making a purchase, and automotive customers are no different. Buyers are now Googling vehicle brands, reading reviews, comparing models, and visiting dealership websites before finally deciding on which vehicles they’re interested in and where they will be purchased. Since Google has announced the types of online moments most relevant to a customer, we need to understand what our market is doing on our websites. The sooner we can deliver the information they want, the more useful we become to our users. One of the ways to identify these online moments is to dive into Google Analytics. In an initial look at one of our clients, we found that one of the differences between mobile users and desktop users was page views on certain pages. A lack of page views and a higher bounce rate on mobile for the Build and Price page and the Our Dealership/About Us page. If clicks could vote, they wouldn’t vote for those pages. It’s not that users don’t care about those pages, it’s just that they’re browsing with a different intent than if they were on desktop. So where did these users go? Most mobile users ended up exiting the website on inventory pages. They found the information they wanted, then left. This means we should cater to what mobile users want and don’t want. Knowing this information, we’re not going to create sitelinks or set landing pages for content which isn’t useful or relevant to mobile users. Doing that doesn’t help the client. Mobile optimization requires a different perspective and approach, and Google provides the tools needed to make decisions for mobile optimizations. The analysts at Strathcom can identify those optimizations which benefit Paid-Search performance and your company’s objectives and goals. Going into 2016, Google reported some big changes in the way consumers are researching and purchasing online. Google has reported that 86% of research is done on mobile, and 52% of these searches are done during work hours. It’s pretty clear we are shifting to a mobile driven world, when we consider these additional stats: we are checking our phones 150 times, and spending 177 minutes on our phones a day. "Mobile-Friendly": Does Your Site Have This Important New Badge from Google? With Canadians picking up tablets and mobile phones in droves to do everything from find a restaurant to buy a car, the online landscape has seen major changes. Google has been there every step of the way to guide this great migration from desktop to hand-held. Now they’ve once again updated their SERPs (Search Engine Results Pages) to make it easier for users to find the best mobile experiences possible. Their most recent innovation? The “Mobile-friendly” label. Now available on a search engine near you! “Mobile-friendly” labels make it as plain as possible for users to identify within search results which sites have been responsively designed for ease of use on mobile devices. When faced with a results page, you should now be able to recognize at a glance which websites will make for a more fluid and frustration-free experience. Here’s a glimpse of what mobile users will see. Having lots of content is most often a good thing for your organic rankings. Just make sure that it shows up legibly on the small screen, including your image files. Even with today’s newest generation of big battery, tablet-esque smart phones, people can only squint for so long before they’ll move on in frustration. Find the happy medium between condensed and readable. You shouldn’t need to combine maximum zooming in and the finest point of your fingertip to ensure you access the right link or entry field. Make sure that page design is thoughtfully executed, or prepare to be overlooked by Google. A dazzling image or a video with a high production valuable are meaningless to your mobile customers if your content relies on software that is unsupported or incompatible with their smart phones or tablets. Unplayable content can arise from many different reasons: unsupported Flash players, license constraints, out-of-date program files. Be sure to test each of your pages and media files on multiple mobile devices before launching any new pages. Why does this matter for your dealership? 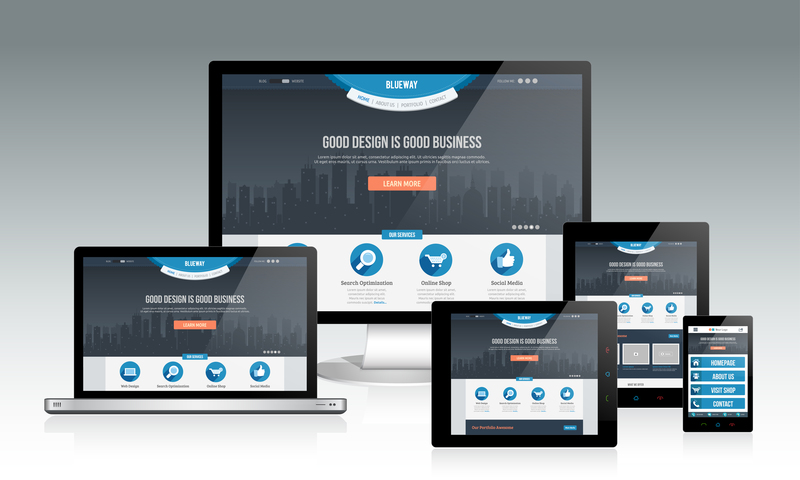 Unless you want to annoy or alienate a good part of your customer base, you should already have a responsive website. Make your first impressions count. “Mobile-Friendly” is your chance to do just that. Imagine this: Someone searches on their tablet for “GMC Sierra in Edmonton,” or “Toronto Toyota Corolla.” Two nearby dealerships appear prominently in the SERPs. One has the “Mobile-Friendly” tag tucked under its site link, but the other doesn’t. Who do you think will get the first shot at that new lead? It’s promotion for your dealership that isn’t self-promotion! You can test your website with Google’s Mobile-Friendly Test. 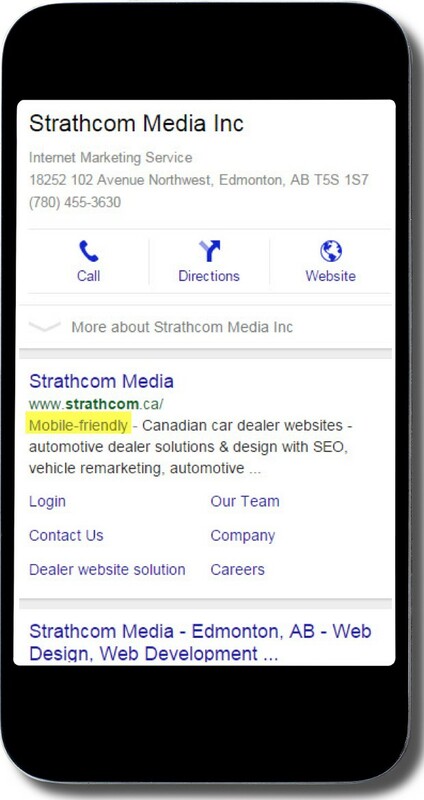 If you currently have a website with Strathcom Media, you are already covered and will see the “Mobile-friendly” label appear in the search results. If not, give the professionals at Strathcom a call at 1 (888) 914-1444, or email us at info@strathcom.com.